According to Bradt Travel Guides, the Komani Lake journey is described as “one of the World’s greatest boat trips”. The tour to Komani Lake & Valbona Valley is a special interest hiking and adventure tour program exclusively designed to offer participants the best combination of pristine wild nature, unforgettable ferry ride through the heart of the Albanian Alps, local folklore and traditions. During these three days you will be able to visit most of the attractions of Northern Albania, combining a variety of exciting outdoor activities with plenty of time to soak up the local culture. Our journey towards Komani Lake begins early in the morning at 05:00 am from Tirana. As we take the turn from the main road to Vau i Dejës the area becomes more rural, with fewer cars but more wild nature and amazing landscapes. We will stop for a short break by Vau i Dejes Lake, a beautiful and tranquil setting. 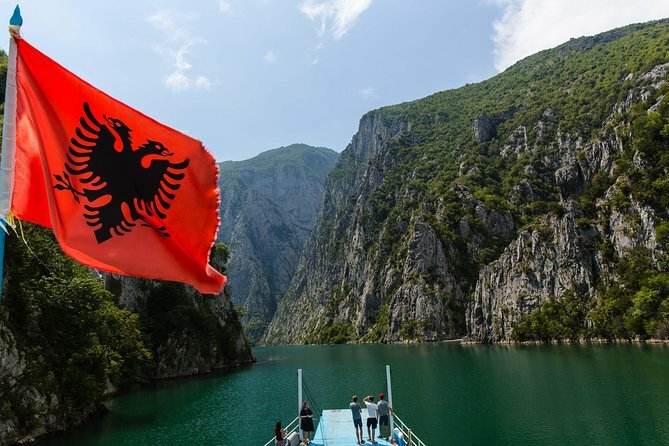 At 09:00 we get on a ferry that will take us through Komani Lake offering spectacular views of the Albanian Alps, waterfalls, rural villages and wild forests. It is considered by many as an exotic experience combined with the unmatched hospitality of the locals. Our next destination will be Valbona Valley National Park. After a delicious traditional lunch, we explore the area and admire the so-called Crown of the Albanian Alps. Overnight in a guesthouse in Valbona. The hiking tour of the Albanian Alps gets more intense during the second day. Our hiking objective is "Maja e Rosit" one of the Balkan Peaks. On the way to the Maja e Rosit Peak we pass through Kukaj. The trekking takes about 3 to 4 hours on the way up and about 3 on the way back to Valbona Valley. The view from Maja e Rosit offers a spectacular view of Valbona Valley and the Accursed Mountains. We will enjoy a picnic lunch from this breath-taking corner of the world. Overnight in a guesthouse in Valbona. Waking up with such a magnificent view of the Albanian Alps will make you want to stay longer, however, after breakfast we will have to leave Valbona Valley towards Gjakova (Kosovo), where we visit the old medieval bazar and enjoy a traditional lunch. We drive back towards Tirana (about 3 – 4 hours drive) through the mountainous terrain of the Albanian North.